Engineers at Massachusetts Institute of Technology (MIT) have developed soft water-based robots which are almost entirely invisible underwater and could be used by the navy to avoid detection. The machines are made entirely from ‘hydrogel’, a strong and supple substance which is mostly made of water. They work, and are move around, by the power of water pumping through their bodies. Because the robots are both powered by, and made almost entirely of, water researchers say they can be virtually invisible. They found that when they placed the devices into water, they appeared almost entirely camouflaged. Scientists released a video of the bots performing a number of tasks, including gently and stealthily grabbing a live fish. The surprised fish seems to have had no idea the machine was close by until it was trapped in its clutches. The researchers are looking to adapt the robots for medical purposes. As hydrogels are mostly composed of water, they are safe to use in a biomedical environment. “Hydrogels are soft, wet, biocompatible, and can form more friendly interfaces with human organs.,” Zhao explained. 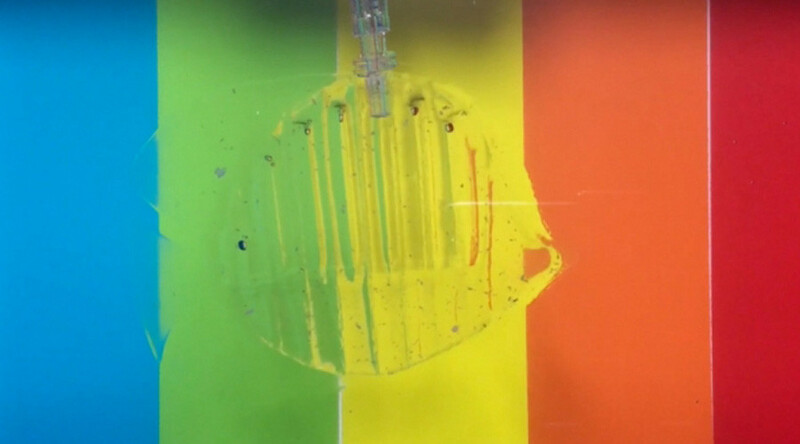 The team has developed ways to adhere the hydrogels to various surfaces such as glass, metal, ceramic, and rubber using strong bonds that resist peeling. In experiments, they found the structures were able to withstand repeated use without rupturing or tearing.